Quilting Adventures: New family member.......and the winner is........! New family member.......and the winner is........! She's an African pygmy hedgehog! She's such a cuty pie! She's been with us since the beginning of June. She was rescued from a bad breeder in Texas. Alright, let's get to the give away! This is the kitted pattern that I've decided to give as the prize. The pattern is called Make Life .... Fresh by Sweetwater. I chose from the Neutral Territory fabric line. It is a line designed by Terry Atkinson and Liz Lois of Red Rooster. 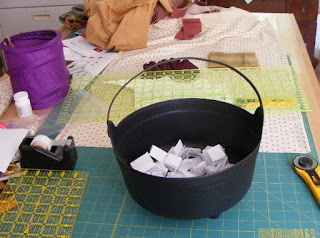 Alright, here we go for the draw. I took out my trusty cauldron again! As I stirred the content of the cauldron, out jumped an entry! Wow! Please e-mail me so that we can arrange for the delivery of your prize. Thank you again everyone! Enjoy the day! Cheers! Congrats to Linda...a generous giveaway! What a cute little hedgehog. Do they make good pets? It looks very docile, but I've never seen one in real life. Awww, look at that cute little hedgie! What a fun new family member! congrats to Linda! I hope it is the Linda in IN I know! I love that pattern! And I really love your new member of the family!